I have been waiting for this day for years! I was first introduced to Trader Joe's when I lived in California a couple decades ago. I loved their selection of ready to go foods and their very reasonable prices. Needless to say I went through serious withdrawal when I moved to Colorado. I would have my California friends send me things, or my parents would stop at a TJ's on their way from Indiana so they could get stuff on my list. But that is not even close to having your own store in which to shop. After years of emailing my request for a store in the Denver area, they finally listened to me (I am sure I am the one who convinced them! ), and we now have THREE stores here. That's right...three Trader Joe's right in my own back yard! The closest one is less than two miles away. I couldn't be happier. All three stores opened today, and I knew it was going to be crazy, but I just had to go. I stood in line for almost an hour, but it was great because we all got to shop while we were in line as it snaked up and down the aisles throughout the whole store. Everyone was well behaved, and the TJ crew members kept the shelves well stocked. It was a great experience. They were almost half the price I usually pay for my flowers ($5.99), and they are in much better shape than the ones I just bought this week. I also picked up a lot of organic produce, all at great prices. This was the best Valentine's Day, ever! I love you, Trader Joe's! Do you have a Trader Joe's in your area? What is your favorite thing to buy there? 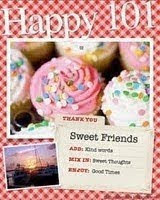 Here are a couple cards I made when I was playing with my stamps the other day. I missed the cut off for Operation Write Home this year, so I'll save them for next year's box. I think the Stickles heart adds just the right touch to this one. What do you think? Gotta love the background stamp that I pulled out of the garage sale box. I just couldn't part with it! I know it is hard to believe, but yes, I made a card. In fact, I have made lots of cards lately. It has been fun playing with rubber (or photopolymer) and ink again. 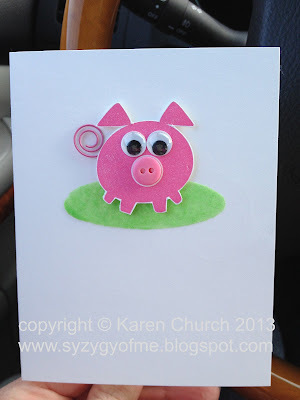 I love the bright colors and the simplicity of this card. It doesn't even need any bling to make it pretty. It is gender neutral, too, which makes it a welcomed addition to my card stash. My bees have done very well this winter, and that is such a relief to me since it is my first year as a beekeeper. It is especially gratifying because I know many beekeepers who have lost 30-50% of their hives this year. It is so sad. The girls have been flying on the warmer days which is normal during the winter. They won't poop in the hive, so they have to take cleansing flights to relieve themselves. After all, they are still eating all that honey and pollen they stored up for the winter. Honey bees can't fly when it is colder than 45 degrees, so there is always a lot of activity on the milder winter days. And lots of poop flying! I went out to check on them today, and much to my surprise, they were coming back to the hive with their pollen baskets full! The juniper and maple trees are putting out pollen and the girls sure are loving it. It felt like spring, but there is still snow on the ground. Little ladies hard at work. More food for the girls. This little girl didn't want to get off my arm. She was so sweet! Yes. Bees can be sweet. At least I think my bees are. They have a great temperament and don't get agitated easily. I was lucky to have gotten such great bees for my first year as a beekeeper. If they continue to do as well as they have been, I plan on splitting the hive this spring, so I can have two hives. Now I can't wait for spring. It is going to be an exciting time in the bee yard! What signs of spring have you seen around your parts? My niece's 18th birthday is coming up next week, and I am trying not to procrastinate so long in getting cards out this year. So far so good since her big day is one week from today. I love how the chevron panel looks like a cell phone, and the message could be a text. That is the part that I didn't plan. I think an eighteen year old might appreciate that more than flowers and butterflies! The bling was also an after-thought, but is just what the card needed...it was definitely nekkid without it. On a side note, just after I posted my "Spring is Just Around the Corner" post, we received over 8" of snow, and it is snowing again today. It is so beautiful outside, and finally looks like winter around here. Yippee! Time to curl up under my afghan with a cup of tea and a good book. Once I finished my ripple afghan and hearts for my tree, I started right in on my next crochet project. I decided I needed a pillow (or two) to go with it. I have always wanted to make a granny square afghan, but since I made a ripple afghan, I decided to make a granny square pillow instead. So I have been crocheting mini granny squares. Two hundred of them so far. They only take a minute or two to make (talk about instant gratification), so it hasn't taken all that long to knock them out. I laid them out in a planned random pattern. By planned random, I mean that each row and each column only contain one of any particular color. Even the edges when placed together won't repeat any colors. I plan on putting a border around the edges, so the border randomness wasn't necessary unless you are compulsive like me and have to have it that way! I have started binding them together...something I know nothing about, and am just winging it as I go along. The work is not bothersome to me because it goes fast, and once again I am instantly gratified as soon as another square gets attached. All that being said, my tree is begging to be decorated with Easter eggs, so this pillow may have to take a back seat until I get some eggs done. I'll be sure to post a picture when it is finished. It has been cold and snowy here this past week, and we are supposed to get more snow this weekend. We've had such a mild winter this year, and are in a pretty severe drought, so we'll take all the snow we can get. But that doesn't mean I am not looking forward to spring! 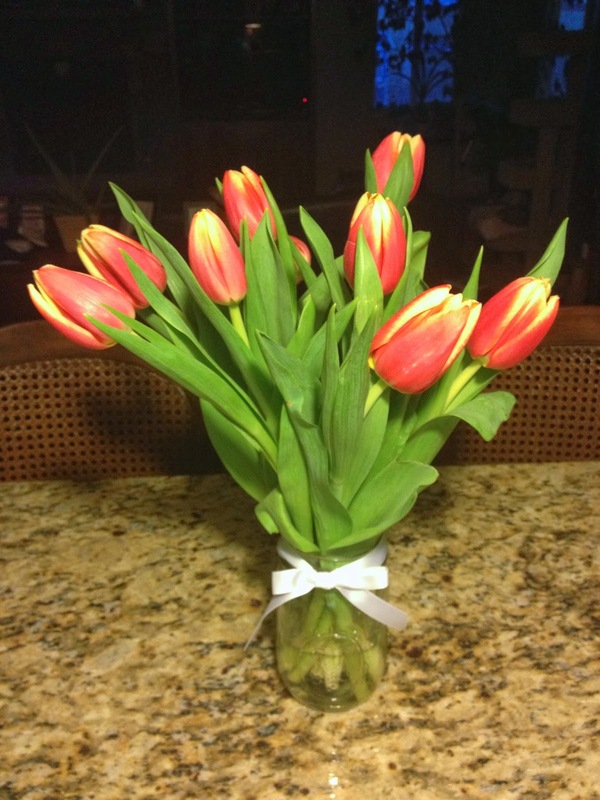 I bought some tulips this week that were not even close to opening. 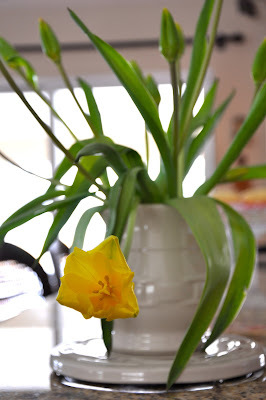 I like to buy my flowers 'green' so I can enjoy their full bloom. Two of them started to open up today. I couldn't have arranged them any better if I would have tried. Little rays of sunshine to brighten snowy days. I made this card for one of my daughter's teammates who is competing in her first Elite gymnastics meet this weekend. She loves pigs, and this one is just too cute. The big googly eyes are compliments of my daughter. She loves big eyes on everything! And the tail, too. When she was going through my 'pink' embellishment drawer, she found the spiral paper clip and thought it would make a good tail. She was so right! Here is a fun little project I have been working on this week. I decided to bring the outside in, and planted jammed some twigs in a pot. I will be able to decorate them with festive holiday decorations and bring some much needed color into the room. 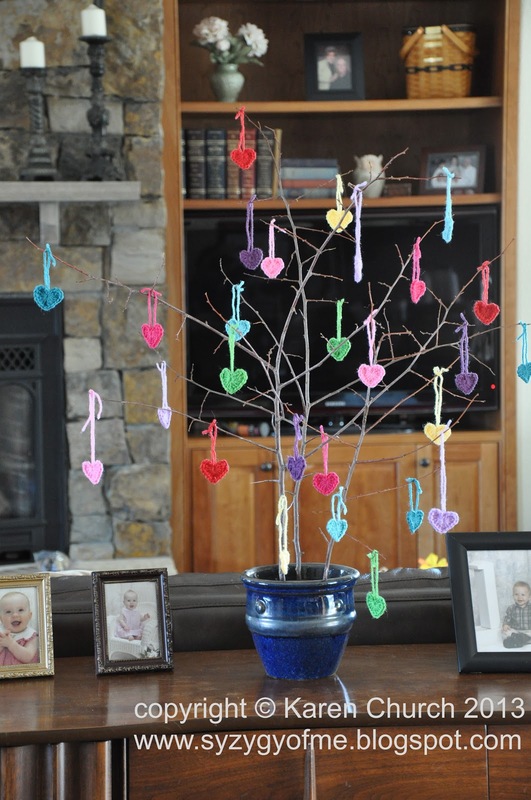 Colorful hearts just in time for Valentine's Day. 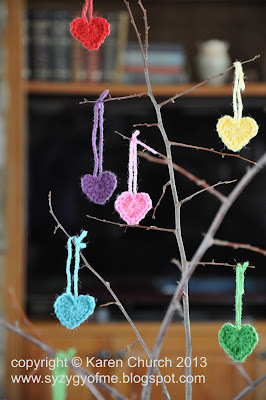 The little hearts are very easy to make, and are a great way to use up scraps of yarn. They only take a couple minutes each. I've caught both cats eyeing them, or in this case playing with them. 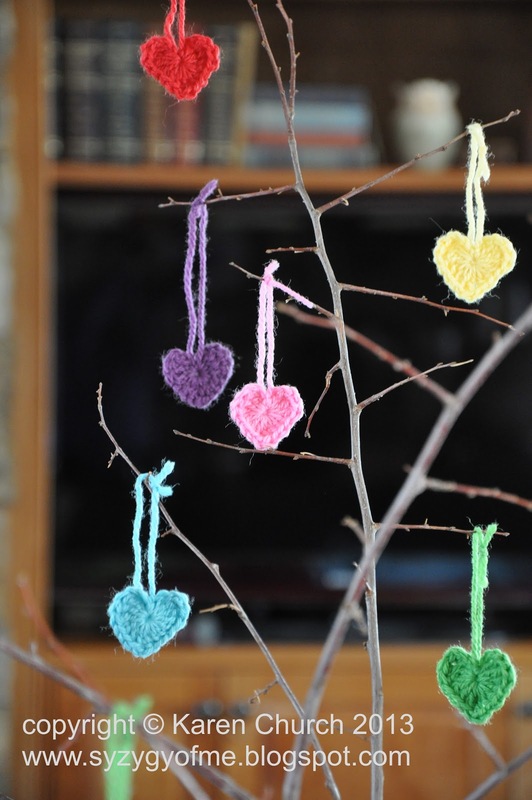 Every time I walk by my 'tree' I expect to see hearts gone astray, but so far, so good. Let's hope they continue to behave themselves! Do you have a 'tree' that you decorate for the holidays/seasons? Someone very near and dear to me (Hi, Mom!) came down with a nasty case of the shingles a while back. If you've ever had this, or known anyone who has, you know it is very painful. I knew she would appreciate a get well card, and I could only think of one thing. To make the shingles, I rubbed a brown ink pad over soft suede paper to give it a mottled shingle look. Then I cut it into strips and added more ink to the edges. Then I put the strips on my ScorPal and used a soft suede marker to make the scored lines. This gives it a nice texture while defining each 'shingle'. Each strip was adhered to the card base with a little overlap. I'm happy to report that my Mom has healed from her case of the shingles. No doubt the laugh from my card helped ease her pain. Do you like to use puns on your cards, or do you think puns are cheesy?